For this season, yes, my shows are over ~ I do two a year and since they were back-to-back weekends, I'm show free the rest of this year! This was my booth (I have to say, that booth looks very messy to me) at Saturday's show at Malabar Farm, "In the Spirit of Friends"which was a fabulous show, for sure! Five gals who are friends, put together a great folk art and antique show that the shopping public absolutely loved! The weather was great ~ the venue was great ~ and the grounds were dotted with primitives and garden art and antiques galore! I was happy to be there peddling my wool and frames to people who love to create handmade goods with quality woolens ~ people were very gracious with their kinds words ~ it was a great day! This is a side view of our booth the previous week at the Quailcrest Herb Fair ~ there's a cute older gentleman back there counting money, I'm sure!! I love that show, scattered among the herb gardens at Quailcrest Farm ~ by the end of the day, my booth looked like it had been ransacked ~ it was a great day there as well! Last week, I dyed wool everyday ~ this is one of my piles of dyed strips that I did ~ I just threw a lot of different wools into the dye pots and whatever happened, happened!! I got some really interesting colors and little bits of color are a nice way for people to add to their wool stash! This week will be devoted to getting the wool room back in order and then maybe I'll resume dying ~ for now, you can't even walk thru my studio since we emptied the truck yesterday and it's all sitting in crates and containers waiting to be sorted! Kathy, one of my blog readers and email friends, stopped by the booth on Saturday and brought me this sweet little nosegay that she made for me!!! A gift for me!! That was very sweet of her ~ and now I got to meet my new friend face to face!!! I so appreciated her thoughtfulness and I loved her telling the old guy how much she likes my blog! Throughout the day, gals would come in the booth and say the same thing!! I couldn't have paid enough for those kind of compliments in front of Sonny boy ~ he always wonders what the devil I do on the computer all the time ~ and these lovely ladies just made my day!!!!!!! Thanks, Girls!!!! And thank you, Kathy!! At the top left sidebar, you may have noticed that I just added my new website!! I started building that thing in March, totally set it aside and just now finished it!! I did it myself!! It certainly has much work to follow ~ I need to really make an effort to build a product line to offer other than frames and hooks ~ I would love to sell wool and some finished things thru there, so that will be on my to-do list in the near future!! I want to offer my classes in a more organized way, too ~ right now, I set up a class to suit the students especially for them but I know I should also offer a schedule of classes for people to sign up for!! This could just be my year to get really organized!! So check out the website and let me know what you think ~ I'd really appreciate that!! And any suggestions ~ we'd love that, too!! We really had a full weekend ~ Friday, we set up the booth at Malabar, and then in the evening went out for dinner ~ Saturday finished setting up before the show started at 10 and after packing up at the end of the day, we went out for supper and ran into friends ~ I was really tired after all that! And yesterday, we had a wiener roast for all the family ~ 19 of us!! The girls all brought such scrumptious food ~ Ami made candied apples that looked so good, the kids all thought Martha Stewart was there!! I was too tired to come up to the house for the camera ~ I should have ~ they were all having such a good time!! To my daughter-in-law Coni, for completing her SECOND "Three Day Walk" for breast cancer awareness and fundraising! Coni was part of a team of nearly 60 gals and guys who, so far, have raised $138,000 this year! I'm really proud of her ~ Coni is small but mighty ~ my son calls her 'Riley' because he says she lives the life of Riley!! ~ and she did it!!! 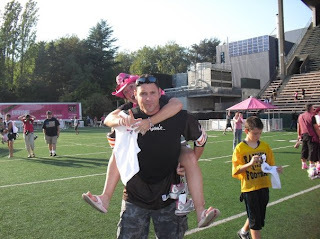 This is my son, Chris, carrying her to the car, no doubt! And the dear little soul in the yellow shirt is their son, Hunter!! The girls must be taking the picture!! Coni looks pretty chipper for just walking 60 miles in three days!!! You go, Girl!! Yes, that's what I'm doing today!! Just thought I'd give you an overview of the many crates ~ there are also five plastic containers full of wool!! I actually packed the crates ready for display ~ so that will eliminate some of the work in setting up ~ after about 28 or 29 years of doing shows, I might be getting the hang of it!! Sonny just brought these frames in from the shop ~ two walnut and two wormy ash (similar to wormy chestnut)! I love the dark frames ~ they're just such a rich color ~ Sonny's frames and stands are nicely finished and they look like a piece of furniture ~ you don't mind having them sit out even if company is coming! The proddy tools just arrived yesterday (yay!) and I also have Hartman hooks in three sizes ~ 9 mm, 8mm and 6 mm. I'll also have linen and monk's cloth packaged in one yard pieces ~ something for everybody, I hope! I even have two more dye pots going ~ just in case!! We'll have some of Sonny's hand-carved spatulas and spoons for sale as well! They're made of applewood and another wood that I swear I can't remember right now! I think he has seven finished pieces ~ that, along with his frames and stands, keeps him busy ~ and of course, his day job which is home building and remodeling!! We don't like him to have too much free time!!!!! Yesterday, I was walking out to Sonny's shop and this WORM was walking across the driveway! I ran and got the camera and picked him up on a stick so I could get him in a better light ~ and snapped his little picture! If you double click on the picture, you can see all his beautiful colors ~ orange speckled antennae, yellow things and blue things and when I turned him over, he has blue feet!!!!! We think it's a big fat tomato worm and if that's so, he has been overeating for sure!!!! Just wanted to share this colorful guy with you! So that's it for today ~ I'm going to start carrying up crates and boxes out of the hooking room into the garage so the old guy doesn't have quite so much to do when he gets home!! I need the exercise and he doesn't!! We'll pack the truck and maybe I'll get a little project or two done yet this evening. As always, there were things I was going to make and didn't get done ~ but most of all I need to get a good night's sleep! We'll leave around 6:30 a.m., drive an hour and be set up by 9:30 or so!!! I always act like it's my first time ~ I can get pretty frazzled by the time the customers start to arrive! As I said yesterday, there's nothing like an outdoor show when the weather cooperates ~ now they are saying rain in the early morning ~ I hope they're wrong! I love doing shows and it's a happy day for me when customers come and love what we're doing! So, if you're in our area, stop by and say hi, shop till you drop and enjoy a beautiful day among the herb gardens at the Quailcrest Herb Fair! Dyed fleece! That's what's in these little bags! Colorful, isn't it? I tried to put some fleece in every dye pot so there would be an array of colors to offer at the show Saturday! Dyed fleece is great for garden flowers, to enhance a field of grass or maybe even to hook a wild-haired angel!! Quailcrest Herb Fair is north of Wooster, so if you get a chance, come by and see us! Our booth is in the tent up by the house ~ my same spot for over 20 years!!!! This was Tuesday dyeing results ~ tomato soup (named by customer, Molly), robin's egg blue, midnight and pea-green!! Yesterday, I started to pack the crates, divide the as-is wool into a more manageable amount (I tend to pack everything~that's just crazy) and price the remnants (small pieces of odds and ends) which are great for adding to your color stash! I sent this photo to a customer to give her an idea of how several pieces of wool dyed the same color, but different base colors, will all blend together. When you're planning a background or any color combination, this will give you a bird's eye view of how it all works together. Kim liked what she saw ~ so this is all going in the mail today!! Thank you so much!!! That's it for today ~ the wool room is calling ~ I'll try to get another post in before Saturday and then I will take pictures at the show for you to see next week. The weather forecast is great ~ low 70's, no rain ~ yippee!!! There's nothing better than outdoor show when all conditions are right! And I mean WILD!!! Son, Teddy and his wife, Miki and Luke & Luci came up to the lake for a couple of days. I have been dying to go to African Safari Park, outside of Port Clinton, and I finally talked somebody into it! It was great! 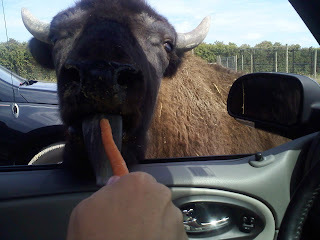 This buffalo was having a little munchie right out of Ted's hand ~ he was one of many ~ there were buffalo everywhere! We ran into someone from home that Ted and Sonny knew and his wife had a picture on her camera of the car in front of them, entirely SURROUNDED by buffalo!! Wondered what those people were thinking? 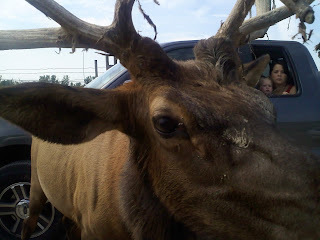 This guy, I believe was a moose! Up close and personal!! I was so flustered I could barely get a picture ~ I had forgotten my camera but the cell phone captured these guys pretty well! 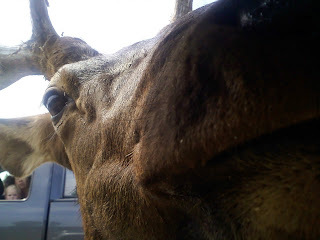 Honestly, when there were these big drooling, slobbery mammoth heads hanging in the window ~ it was a little unnerving! It's a wonder the animals aren't fat ~ there were so many cars going thru and when we left, they were lined up out to the road! A very popular tourist attraction to say the least! Same guy ~ just a little more perspective!! Look at the people in the truck next to us ~ that little boy was in awe ~ as were the people in our backseat!! Grandpa Sonny tried to get out of this little jaunt but we buckled him in and away we went! He had as much fun as the rest of us!! Luci screamed at every new head in the window and poor Luke had his share of slobbery faces hanging in his rear window! Miki kindly let me ride shotgun with Teddy, so she remained unscathed sitting in the middle of the backseat!! 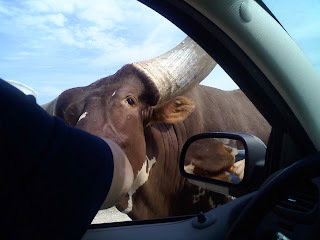 Teddy wanted to feed this BigHorn steer from afar ~ his horns were ENORMOUS and kind of the grazed the car in front of us!! They were pretty imposing figures as they lumbered toward their next snack! Which, by the way, the park made a fortune on ~ the snacks! They give you a container of pellets and we could buy bags of carrots ~ lots of carrots!! We'll take our own next time but if you don't have food ~ ta ta ~ they're on to the next car! This white deer was pretty tame compared to all those big critters ~ there were lots and lots of deer for sure! At the end, there were giraffes and zebras but all behind big fences ~ not nearly as much fun ~ but beautiful to look at ~ a giraffe is pretty darned tall and Luci observed "look at the knees on that one"!! We laughed a lot and Miki's car looked like it had been thru a war zone ~ inside and out! I was going to vacuum for her but time got away from us!! 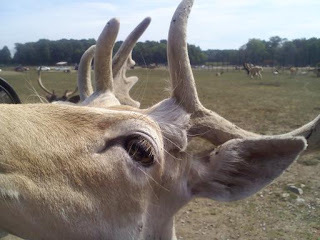 If you're in the area of Port Clinton and Marblehead, you really should take a carload of your nearest and dearest and visit African Safari ~ it was hysterical ~ and who couldn't use a good laugh and some family bonding these days??!! On Friday night, we went to the French restaurant in Vermillion to their lounge Touche' ~ that was fun!! Pomegranate martinis and artichokes with alouette cheese for an appetizer!! Then on to Quaker Steak and Lube for wings!! We know how to dine, don't we?! Saturday afternoon, before the kids arrived, we had a Clean out the Fridge party! We had so many odd bottles of beer, wine coolers, and wine ~ so we hauled it all out on the neighbor's patio and they brought out what they had and we all made appetizers! Sonny made his stuffed jalapeno's and we had a little feast ~ pretty darn good! We grazed all afternoon and then in the evening, they started a fire in John's firepit and we roasted hotdogs for our late night snack! The kids liked that a lot and the next night, Karen was in charge of making pies over the fire! That was a first for me, since I wasn't a Girl Scout or a camper ~ they were yummy, too! So it was a fun-filled weekend ~ last weekend of summer ~ hard to believe that we're heading into Fall already!! That's what I've been doing these last few days! This color was kind of a fluke ~ but it looks great! It turned out a great fuschia color with lots of mottling! Don't you think it will hook into beautiful flowers? I really want to concentrate on offering more dyed wool ~ the colors are so soft and beautiful and really help to give our rugs an older look ~ dyed wool gives a rug a kind of patina that we just don't get with as-is wool. These are just a variety that I put in the dye pots this week ~ a nice robin's egg blue, a couple of golds, some nice pumpkiny colors ~ and I dyed fleece with all of them, too. I took these pix in a hurry yesterday so I could post them to the blog before we left home and put them in the save file. Now I'm adding the text from the lake! We came up last night ~ yippee!! And this is nice pile of neutrals ~ good for dying or light backgrounds or sheep. These are all as-is but I had never cut up the wool when I got my last shipments. So I spent a good while cutting it all into half yard pieces and folding it ~ getting ready for my two upcoming shows! Kind of makes me wish I had done that right after I processed it all! Sometimes I do get the wool snipped into half-yard segments beforehand so all I have to do is the tearing ~ even that little bit done ahead helps! For those who don't work with wool, there really is a lot of preparation before we even set down to hook! This is a great collection of as-is ~ nice dark antiquey colors! My arms were tired after all that ripping and tearing ~ but the smart thing I did was to do it outside so I didn't have all that wool dust in my hooking room!! I figured out that little trick last year! I set up a card table outside the door and just haul wool in and out and tear away!! And I get a little fresh air and sunshine while I'm at it!! I am always astounded at the amount of wool dust that settles after I've had a class or a group in to hook! I'm hoping to get a little hooking time in this weekend ~ I fell off the 10 minute hooking challenge for two weeks ~ but I'm back on it now! I've done something that is hooking related everyday this week ~ as well I should, in light of the fact that I have two shows back to back! We have lots of fun planned for the next few days up here ~ it looks like it's going to be great weather so we have to take advantage of it for sure!! Sonny is cleaning windows so maybe I should do a little vacuuming or something so I look productive! He has a hard time understanding how I can spend so much time putting a blog together ~ he thinks I'm 'playing' on the computer!! Little does he know that this thing can drive me crazy!!!!!!! Some would say it's a short drive! Have a great Labor Day weekend ~ I'm sure I'll have some stories to tell next week! CONGRATULATIONS to our lake friends, Carol and Bill~ they became grandparents for the second time on Wednesday ~ daughter, Lisa, had a big bouncing boy ~ I don't know his name yet!! All of our friends up here are younger than us (they like hanging out with old people!) so their kids are just now starting their families ~ our grandkids are all in school now as of this year!! Take care and have as much fun as you can!! This is the last of the Sauder rug show rugs ~ and I have to tell you that I had written almost this entire blog down to the next to last photo and left the page without "saving" and lost all the text I had written!!!!!!! This is not the fun part of blogging!!! I could scream right now but instead I will tell you about these rugs!! These two really speak to the rug hookers world ~ one sweet little lady creating her work of art and another at the thrift sale, gathering her bounty for her next creation! I love the dark rich colors in the 'house on the hill' rug ~ wish I written the name of the pattern and the designer ~ it's one I would definitely like to hook! The 1875 ship has those same dark colors ~ very dramatic looking! And the little red house with the big trees bending over it is also an appealing little pattern. Great care was given to detail and exquisite hooking technique to make this a beautiful rug. I think these three photos are all from the Celebrations portion of the rug show ~ but don't hold me to that. This sunburst rug is one I've seen on the rug hookers blog and on The Welcome Mat, I believe ~ the face is sculpted ~ felted, I think ~ a very unique piece! As is the Andy Warhol style dog montage ~ it's really eye-catching! The colors of this rug just spoke to me and I felt it was one of the most beautiful rugs in the show. An interesting thing about a rug design like this is that once you color plan one quarter of the rug, the color planning is done ~ and then all you have to do is hook and hook and hook!! It was a sizable piece ~ I can't imagine how long it must have taken! This rug was like looking through a window ~ potted plants on the windowsill and all that greenery on the outside ~ very well planned and executed! It was in the "original" section of the show. Both these pictorials were just like photographs ~ that's the difference between the narrow cut and the big 9 and 9.5 that I like to hook with! You can't get that kind of detail in the primitive style that works for me. These were absolutely gorgeous works of art! !